This was initially where I stashed my portfolio. I wanted the site to look as simple as it can be. I didn’t want its look to compete with the other sites I featured. Let’s just say the site had a lot of growing up to do since the owner also had undergone a lot of transitions. I would have done this site in flash, but seeing as it will not really remain static, I thought it would be easier to edit if it were HTML. The site has become my lifestyle blog since the beginning of 2010 and I’ve moved my portfolio to Sarimanok.PH (this site). I then contracted a former student to draw a winged Neko Valkyrie, which I used as the site’s avatar. For version 2010′s full story, you can visit the blog itself. For 2011, I contracted my sister’s boyfriend, Paolo Lazatin, to create an old-school 24-bit video game type illustration based on a sketch I did. I remixed the blog’s colors to make the atmosphere seem lighter and fun and created a masthead out of Pao’s illustration. Full details of Skysenshi 2011’s development can be found in this post. By the way, Pao is also responsible for the mascot and avatars drawn on Sarimanok.PH’s masthead. 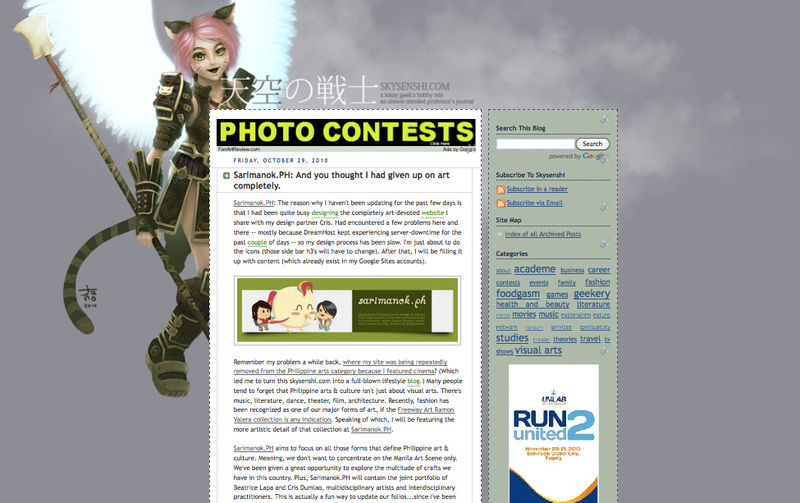 This entry was posted by skysenshi on March 11, 2011 at 7:20 am, and is filed under Web Development. Follow any responses to this post through RSS 2.0.You can leave a response or trackback from your own site.